Derived from two NBC concerts given in November 1942 and April 1944 these all-American concerts (given that Loeffler was born in Alsace and Mignone in Sao Paulo) demonstrate the range of Toscanini�s enthusiasms and expertise. We get an invigorating slice of his fringe repertoire in recordings that presumably derive from discs supervised by Richard Gardner, a favoured recording engineer of Toscanini�s. They sound very well indeed with some exceptional spatial detail audible, not least in the earlier concert. Allied to which the repertoire ranges from cantilena to melodrama and back again and makes for a satisfying programme. Loeffler�s tone poem is peasant dark with an admixture of Russian threnody to which we can add Mussourgskian surge and a sense of evocative romanticism; maybe also a sly reference to Volga Boatmen. Its last movement, commemorating a death, is eerie in the extreme and beautifully extrapolated by Toscanini. Paul Creston�s Choric Dance No. 2 opens quite melodramatically and soon explores rhythmic implications with concentration and vivacity; more an exercise than a totally convincing piece but certainly bracing. This was the première of Morton Gould�s A Lincoln Legend, a piece that opens with contemplative string writing but soon introduces a raft of quotations (John Brown�s Body among a number) in a determinedly vulgar melange � at least I think it�s determinedly vulgar. After the tumultuous Americana we return to the more reflective intimacies that had ushered us in. The 1942 concert and the first disc conclude here with Rhapsody in Blue in a performance given by Earl Wild. He was the youngest soloist to have played with the orchestra and always wondered why he and not a raft of others had been selected. Wild reminisced elsewhere that he later found out that Toscanini used to listen in to NBC�s chamber concerts on Sunday mornings and had heard Wild there � a more or less humble NBC staffer catapulted to fame. The Rhapsody comes complete with a celebrity clarinettist in the shape of Benny Goodman, soon to test classical waters with the Budapest Quartet but not yet a student of the legendary English player Reginald Kell. His nervousness shows with a fluffed note at a registral change but it�s salutary to hear Goodman�s wailing opening bars. Toscanini unfolds during the performance and Wild is fine though not as idiomatic as he was later to become (especially with Fiedler); the ending is magnificent though and properly conclusive. Mignone�s Festa das igrejas evokes the solemn simplicity of Brazilian religious contemplation before unleashing fiesta drama with buoyant parts for piano and bass pizzicati. Mignone certainly introduces lashings of colour, alongside the rapt passages for solo strings and the brassy processionals and fanfares, ending the piece in pearly � maybe gaudy � grandiosity and rambunctious Christmas festivities. It�s played here with dollops of wit and rhythmic drive. The 1944 concert ends with the Concerto in F with Oscar Levant as soloist. Levant had first worked with Toscanini the previous year and had pointed out something in the score of the Concerto in F to the conductor. According to Levant�s memoirs the Italian sniffed a bit and said "Thatta poor boy�he was a-sick" and that was that. 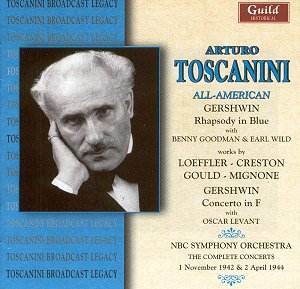 I�ve read that there was considerable antipathy between soloist and conductor, but Levant was generous to Toscanini in his autobiographies and said his accompaniment in the Gershwin was "truly remarkable." There are perhaps one or two moments when one feels Levant chaffing somewhat but it�s a cohesive performance and very well recorded. Imagine my frustration on reading the booklet notes that in the first sentence contain the names of American conductors previously unknown to me � John Barnett and Richard Bales amongst them � and the feeling of piqued animosity thus engendered towards the writer. He turns out to be Rob Barnett, editor of this site. There�s no place for sycophancy here but he writes with his accustomed blend of authority, energy, adjectival incandescence and the unearthing of unusual nuggets in a style that has come to be known as Barnettian. It caps a fruitful and splendidly enjoyable double from Guild.